You do not have to do it alone. You do not have to do everything. I can help you and your team craft solutions, build plans, and finish projects. People working toward a common vision need to work together well. That’s how organizations thrive. I roll up my sleeves alongside you and we get it done together. I promise – the process will be enjoyable and productive. "Annie draws out participants in a gracious style that makes everyone feel valued and brings out the best in everyone present." Bringing me on board to help take the load off is easy. Let’s make a solid plan for your organizational or community change! Are you or your team overloaded? Worried people are burning out from the stress of it all? I can help you make the changes needed for a healthy, vibrant workplace. Check out my Room Next Door program and let’s talk about getting back from the brink of burnout! I consult and facilitate through my consulting practice, Vessel Strategy and Consulting. For organizations or consortiums that need support facilitating and managing a statewide or citywide campaign for community change. For businesses or organizations that need support clarifying their direction, fostering strong teams, and implementing better strategy, systems and structures. 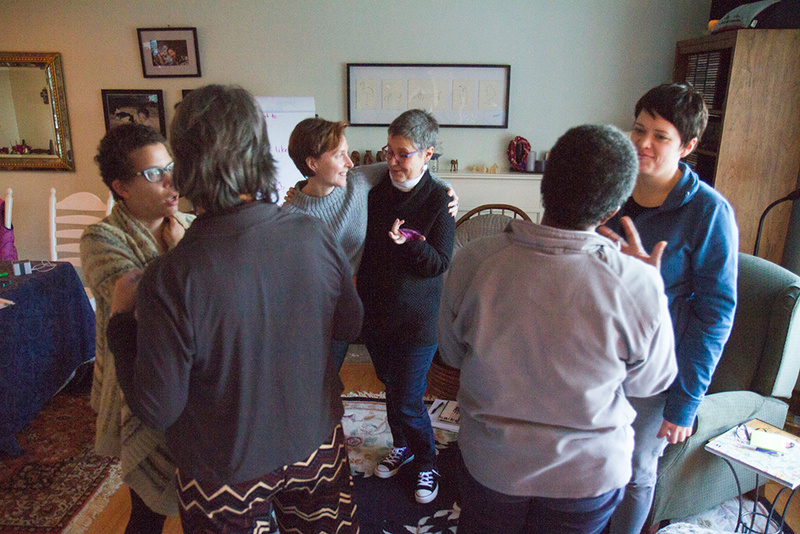 I facilitate engaging meetings and retreats that connect people across difference, and result in action.